ZTSport Digital Chronograph, 100 mts/10 ATM Water Resistant, Red Silicon Strap, Quality 3-Hand Sport Watch. Men have just two shots at jewellery – a wedding ring and a watch, and it is only the latter that can be styled according to occasions and moods. For women too, watches are a great way to accessorise and accentuate the overall look no matter what the occasion is. While designer watches are in huge demand all over the world it is the Sports Watches category that has taken the industry by a storm. ‘Fit’ is the new ‘in’ thing and sports watches are not only a good companion for a workout session they also look exceptional for casual wear clearly vouching for your impeccable fashion sense and your bend towards being fit. TJC brings for the style-conscious men and women of UK a trendy collection of sports watches at the most affordable prices possible. Now make a statement with the choice of your accessories at every instant possible. 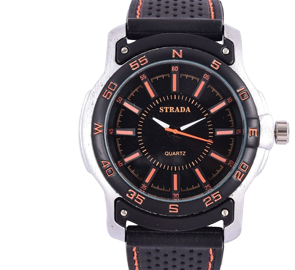 Featuring pieces from Strada, ZTSport and Rubba, we have a sports watch for everyone suiting their individual style and budget preferences. Affixed with Silicone straps for resistance to water, wear and tear and irritation because of sweat, these watches will sit effortlessly on your wrist all day. Get into the action with these selected exclusive models flaunting chic colours and designs at incredible prices. These sturdy and functional sports watches can be worn for either work or outdoor activities for an impeccably classy and modernistic look always. These versatile timepieces also make a thoughtful gift for your loved ones, perhaps your best man or a friend that you know is a fitness freak. Pick sports watch from TJC’s collection today for yourself or for a friend that will complement the personality while enhancing the overall look.